Baby Buckshot had his two month check up today. It's the first appointment since I went back to exclusively breastfeeding (with the occasional formula bottle in case of emergency when we're out and about) so I was concerned about his weight gain and his height. I wasn't so concerned with his head circumference because it seems proportional. Well, our little BB is in the 90th percentile for height, 75th percentile for weight and I forget his percentile for head. But his head is well balanced and rounded, according to the doctor. The milestones he was looking for was the ability to socially smile, cooing and babbling, the ability to track objects and people with his eyes, and head and neck control while on his tummy. BB smiled for the doctor, had a little baby conversation with him and maintained good eye contact. Doctor said that BB had the head an neck control of a 3-4 month old because, when placed on his stomach, he was able to get up on his arms to raise his upper body in addition to being able to lift his head and turn it side to side. He also noted that the level of eye contact BB maintains is advanced. Hurrah! Then, it was time for the vaccinations. I have opted for delayed vaccinations, the explanation I'll save for another post tomorrow, and opted for only the Pediarix (DTAP, Hep B and Polio) and the oral vaccine for Rotavirus. I delayed Hib and PCV13, adding a 3 month appointment just to administer those vaccines, as to not overwhelm his system. If they could have split up the DTAP from Hep B and Polio, I would have done that too but it wasn't an option for us. Now the nurse said most babies like the taste of the Rotavirus vaccine, which BB did not. BB also likes the taste of his Vitamin D supplements, which the nurse said most babies don't like so it seems my baby has the Chris Kimball of palettes. 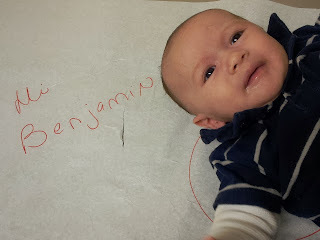 He cried a bit after the oral vaccine and loudly after the injected shot. He calmed down quickly as I rocked and shushed him and once I fed him a little he fell asleep for about 30 minutes. Then he needed to nurse nonstop for about 5 hours before he would fall asleep without needing to be attached to me. His temperature is also running high, which I was warned about, so I gave him a dose of infant tylenol shortly after the appointment to prevent febrile seizures. I assume he'll be fussy for the rest of the day.